As social media becomes an ever more integral part of marketing and customer interactions, businesses must find ways to encourage their users to show their love on Twitter, Facebook, and other social media sites. Gamification is a fresh way of enticing users to interact with the content on your site by turning common interactions into a game. PunchTab is a gamification platform that makes it easy to provide both concrete and abstract incentives to users, and has already yielded excellent results for a few prominent companies, including Arby’s and eBay, and we explored their services ourselves. Installing PunchTab is an easy process. The site provides drop-in code for blogs and a step-by-step walk through if you happen to be a self-hosted WordPress user. And if you’re willing to pay for the premium “Expand” package, PunchTab will run a custom campaign for you for $999/month. The user interface is straightforward. Once users have logged in they can access their information via a dark grey bar on the bottom of the screen. 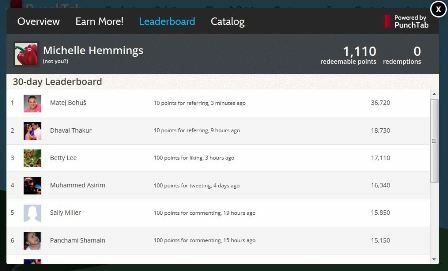 The Leaderboard adds to a sense of competition; you can see who else is “playing” on the site, and how many points they’ve earned and for what actions. PunchTab provides three methods of incentivizing user interaction: badges, rewards, and giveaways. Badges provide a free, simple “reward” for different actions; a colorful badge that appears on the bottom bar. Users can earn badges and level up as they perform basic, relatively easy actions such visiting the site, commenting on posts, and mentioning products on social media sites. There is no outside incentive for earning badges, but users can compare their badges to those of friends and other users on the site, and gaining them is easy enough to be gratifying. Rewards offer users a chance to earn points for concrete prizes that are provided by PunchTab at no extra cost; prizes range from $5 gift cards to Starbucks and Amazon up to a Kindle. Giveaways are the most customizable offering at the free level, as you can choose what you are giving away, how users can enter to win, and how long the program lasts. The platform caters wonderfully to the instant-gratification mindset of many consumers. PunchTab rewards users for doing things that they’re already doing on your site. This keeps your active users happy by rewarding their loyalty to your site. It also provides an incentive to customers who might visit your site often and enjoy your content, but who don’t interact in an active way. Earning badges or getting points towards a small prize can give users the incentive to like your company on Facebook, Tweet about your services, or write comments. 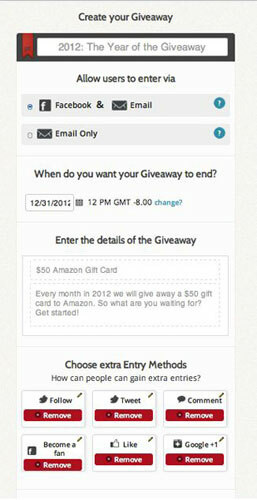 When it comes to planning a Giveaway, PunchTab excels by making the process easy to customize. However, PunchTab’s free “Start” platform takes a one-size-fits-all approach that may not work for every site. The badges and bottom bar are clunky and cannot be customized. The prizes for the rewards program are on a fixed point system, and the thresholds for actually earning rewards are very high (25,000 points for a $5 Amazon gift card, at 100 points per interaction, does not make earning easy), which might discourage users from remaining engaged long enough to actually earn a prize. For $99/month you can opt for a more powerful version- you can choose your own prizes and have more flexibility on how users earn points and badges, but customizability is still somewhat limited. A white label version is available at the $999/mo level, but otherwise you’re stuck with a design that may clash with your own site’s design. PunchTab comes with its own built-in tool for measuring metrics, which lets you track how users are interacting with your site and gives you a “CRUSH” score, similar to a Klout score, which lets you see how your site ranks in popularity and connectivity compared to other sites that use PunchTab. While it is useful to track user interaction, CRUSH isn’t available for the free version of PunchTab. As far as metrics go, there’s always the chance that the results for an incentivized site are skewed. Using PunchTab might leave you wondering, are people sharing a link because it’s interesting, or because they’re trying to get that $5 Starbucks card? If you’re looking for a quick and dirty way to increase your social media visibility and get your users to interact more actively with your business, the free version of PunchTab is a straightforward, simple way to encourage engagement. You can grow your reach easily by getting users to share your content with their friends and foster loyalty among users to make sure that you receive continued exposure. But unless you’re willing to compromise cost for control, PunchTab gives too few options for all but the most basic (or most extravagant) of social media campaigns. For more information about Punchtab visit www.punchtab.com. For more on Punchtab’s levels of service visit their Plans & Pricing page.